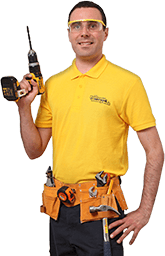 Quality workmanship and pros who are backed up by £5 million insurance. Fantastic Handyman will make your kitchen great... on a budget! A busy kitchen is often riddled with knife cuts, burnt spots, and tomato sauce splatters that are likely to get in the way of your cooking experiments. The dexterous professionals know that and will bring the needed worktop clamps, sealants, and other supplies to make your new kitchen worktop installation happen. To ensure that your fitting workshops upgrade is just as appealing as it is practical, the pros will also pay extra attention to smoothen any rough edges with a special curved-edge workshop jig. When the specialists do their job and you enter your improved kitchen, reaching for that chef hat will be just a matter of time! Usually, the kitchen worktop installers will get the task done in about half a day. However, more extensive restoration procedures could push that timeframe up to a whole day. Do note that our replacement of worktops service is based on the time the pros spent on-site and is charged for the initial hours and then for every half an hour. This will save you extra budget funds, which you can invest in renovating your cupboards or replacing the worn out framework of your kitchen door. So, choose a day, usher the pros in and make your kitchen great again. At Fantastic Handyman, each professional is a man of many talents. 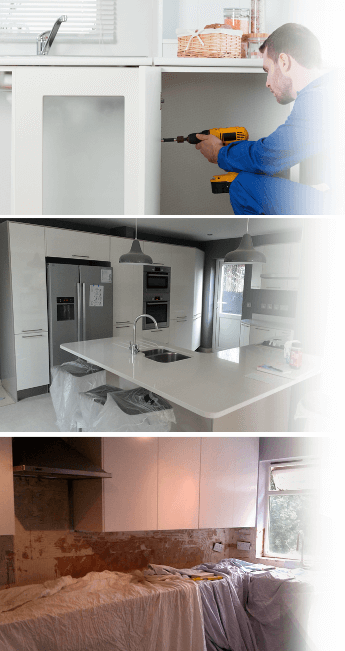 Having received special training and always wanting to perform at their best, these skilled specialists can do anything from installing kitchen worktops to fitting a new kitchen and do so in accordance with your instructions. The pros are punctual, wear neat uniforms, and are well mannered. So, whether you’ve hired them for replacing a kitchen worktop or for a completely different project, you can always be sure that our service will deliver the results you’ve wanted all along. Need to join worktops together or a complete kitchen overhaul? Then use our client-friendly booking form to set-up your appointment with just a few casual clicks. Of course, you can always get in touch via your phone to contact our polite and helpful representatives and receive a free of charge quote for a replacement of kitchen worktops across the UK. Note that our contact options are available 24/7 and you can arrange same-day bookings at any time. So, what are you waiting for – get your kitchen back on track today!